Microsoft Word is the most common word processing application in the world. Whether you’re a student working on a term paper, an activist blogging about your passion, or an entrepreneur working on your next business plan, you’re likely generating multiple Word files a day in pursuit of your goals. What happens when you can’t find that project you’ve been working on? Thanks to some tools built into the Windows operating systems, and the helpful backup function of Microsoft Word, you typically can find your lost file on your own. For the times when you can’t, look to data recovery software like ParetoLogic’s Data Recovery Pro to locate and recover your Word files. Like most lost files in Windows, start by looking in the recycle bin. We’ve all accidentally sent important files to the trash once or twice. The recycle bin can be your one stop shop for lost Word files. Essentially, you want to make sure to be as general as possible with your search criteria. This will give you the best odds of finding the file in question. If you can’t find the file through Windows search, try searching the recently opened documents in Word itself. By opening the file menu recently opened documents can be viewed. If that fails, it’s time to enlist the help of a dedicated data recovery software suite. ParetoLogic’s Data Recovery Pro is a file recovery program that can find lost files, emails, email attachments, and you guessed it, Word documents. Data Recovery Pro exploits the fact that when you “delete” a file; the information isn’t deleted from the hard drive. Instead, the operating system marks the space for the file as available. So long as no new data is written to the Word file’s location, it won’t be overwritten or erased. If you use the software before the operating system uses that part of the hard disk, the space will get marked as unavailable, and the location will be re-associated with the file name. Windows uses the hard drive for many of its tasks. Your lost Word file is at risk of being erased with every activity; as such, you should stop using the computer immediately! Do not turn your computer off before trying to recover the file. Don’t download anything except Data Recovery Pro. Once installed, the software will help you recover your lost Word files, so long as they haven’t been overwritten. Losing a Microsoft Word file can be easy; but thanks to software like ParetoLogic’s Data Recovery Pro, recovering the lost Word file can be easy too. If you can’t find a Word file in the recycle bin or through searching; use Data Recovery Pro. There are multiple reasons entire hard drives are deleted. Sometimes an operating system is so corrupted that the drive is replaced for fear that there may be bad sectors on the drive. Other times the drive may be deleted from a system accidentally as the case of an attached storage device that an end user had permissions to remove. Then there are situations where drives are deleted to veil activities of previous users. In any event, just because the drive has been deleted, doesn’t mean that the data it contained is gone for good. Quick use of a good data recovery suite like ParetoLogic’s Data Recovery Pro can often restore a deleted hard drive. Can I Recover Files Manually? If you can’t see the drive from the Windows explorer, the answer to this question is generally no. However, that doesn’t mean the data you are looking for is gone forever. It is very possible that with the help of third party software you can recover the deleted hard drive. How Can I Restore Files That Are Gone? If no new data has been added to the drive, the files aren’t really gone. They are still in the same location they were before the drive was deleted. All that is missing is the record of the physical address they occupied, and a flag that indicates the disk space is not available for new data. Almost every activity you conduct on your computer writes information to the hard drive. If the deleted drive you are trying to recover is still active on a network or shared with other devices, the lost file you are trying to recover could be wiped out at any moment; you need to stop using the computer immediately and ensure other users can’t access the deleted drive! Leave your computer on and download Data Recovery Pro. Once you have installed it, the intuitive user interface will help you quickly restore the deleted drive or any files on it that haven’t been overwritten. For small offices and other small business that manage their own IT infrastructure but don’t have a dedicated IT staff, ParetoLogic’s Data Recovery Pro is a must have to maintain data integrity. Whether you’re looking to restore a deleted hard drive, or just find a few missing files, Data Recovery Pro is the perfect application. As computer users continue to adapt the personal computer to different areas of life; the level of sophistication employed by end users increases. Today it is not uncommon to have average users routinely manipulating partitions on their hard drive to re-distribute space, increase computing speed, and protect various programs or data. The downside of increased comfort with performing changes to the basic structure of the storage architecture is the risk of user errors. It’s bad enough to mistakenly delete a file, but it’s becoming increasingly common to hear of users deleting entire partitions in error. When this happens, it’s best to obtain a powerful data recovery suite like ParetoLogic’s Data Recovery Pro to recover the lost partition. Even though it’s unlikely you’ll find what you’re looking for; the first place you look should for your file is the recycle bin. Some disk maintenance applications will actually dump the contents of the partition into the recycle bin, so a quick look can sometimes locate the missing file. When you’re not lucky enough to find the files in the recycle bin, it’s even less likely that you’ll be able to find them via Windows Search. Nonetheless, you should at least attempt to search for the files before spending money on third party software. After you’ve satiated that requirement, move on to purchasing quality data recovery software. When a general search doesn’t aid in your lost file recovery efforts, use software such as ParetoLogic’s Data Recovery Pro. The program will restore files from your deleted partition so long as new data hasn’t take its place. Data Recovery Pro can also restore lost emails, attachments, videos, photos, and files from external devices like iPods and network attached storage devices. Data Recovery Pro works because when you “delete” a file; the information isn’t physically removed from the hard drive. Instead, the operating system marks the space where that file is located available for use. Until new data can is actually written to that location, the old file is still salvageable. If you use the software before the old partition is re-used, you can recover the data from the partition. Most everything you do on a computer writes data to the hard drive. Because the deleted partition risk of being erased with every activity, you should stop using the computer immediately! Leave the computer on, and make sure you don’t download additional files. This includes new virus definitions and automatic updates! Immediately download Data Recovery Pro. Once installed, it will help you recover the lost partition with a simple yet effective user interface. 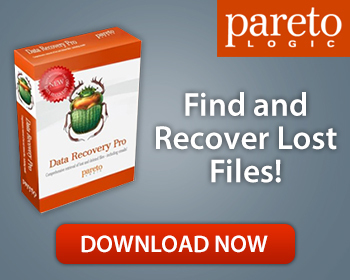 ParetoLogic’s Data Recovery Pro is a powerful yet easy to use data recovery software suite. If you have need to quickly restore a deleted partition, use Data Recovery Pro as soon as possible to prevent additional lost data. Operating systems have come a long way in the past 10 years or so. Not that long ago, it wasn’t uncommon for simple application installations to corrupt the operating system to the point the drive or partition would have to be re-formatted, and the operating system would have to be reinstalled. Thankfully today, hard drive formatting is usually to setup partitions, or re-allocate existing resources. That being said, what happens if you come to realize that you needed some information from that freshly formatted drive? Your options are limited, but you still have options. So long as you haven’t started dumping a bunch of new data on to the re-formatted drive, you can use ParetoLogic’s Data Recovery Pro to recover data from a re-formatted hard drive. The quick answer to this question is no. That being said, it is important to understand that the data you are looking for is still on the hard drive, and it is 100% feasible that with the help of third party software you’ll be able to restore the re-formatted hard drive. Simply put, the files aren’t really gone. They are still in the same location they were prior to the reformatting of the drive. The only thing that is gone is the record of their association with the physical address they occupy, and an indicator telling the disk and the operating system that the area is not available to be written to. With that understanding in hand, all you need is a solid data recovery software suite. ParetoLogic’s Data Recovery Pro is a powerful data recovery software suite that can find lost emails, email attachments, file, and even files on external devices such as your iPod. As you might have guessed Data Recovery Pro can also recover a reformatted hard drive. Whenever you do something on your computer, you are writing something to the hard drive. Because the lost file you are trying to recover could be overwritten at any time; you need to stop using the computer immediately! Additionally, you do not want to turn your computer off before trying to recover the file. The very next thing you want to do is download Data Recovery Pro. Once installed, the software can find any file or file system on the hard drive so long as its location hasn’t already been re-allocated to other data. If you have need to restore a reformatted hard drive, ParetoLogic’s Data Recovery Pro is a just what you’re looking for. The software is the perfect application to resurrect data on reformatted drives and storage media. It’s a handy little tool that’s been conveniently located on the desktop since the rollout of Windows 95. Long time Windows and Mac users alike kindly refer to it as the recycle bin or trash can. This way station for files we are pretty sure we’ll never need again sometimes becomes home to unintended guests. Ordinarily, this is no big deal as files can be restored from the recycle bin. It’s only when a file is permanently removed from the recycle bin that users have cause to worry. But so long as prompt action is taken, and software like ParetoLogic’s Data Recovery Pro is used the odds of a successful recycle bin recovery are pretty good. The overriding theme is to be as general as possible about the file search criteria. It’s easier to pare down your search results, than to fail to generate results because of stringent search criteria. When a general search doesn’t aid in your lost file recovery efforts, immediately look to a file recovery program like ParetoLogic’s Data Recovery Pro. Data Recovery Pro is a software suite that can find and restore lost emails, files, email attachments, and even files on external drives. Data Recovery Pro works because when you “delete” a file; the information isn’t immediately deleted from the hard drive. What really happens is that the operating system marks the space where that file was located as now being available. Until new information is saved to that location, the old file is still where it was. If you use Data Recovery Pro before the operating system utilizes that section of the drive, the space will be marked as unavailable, and the file can be recovered. The hard drive is accessed for nearly everything that happens on your computer. The longer you use the computer before trying to recover the file, the greater the likelihood the file has already been overwritten. In other words, STOP USING YOUR COMPUTER. Do not cycle the power to your computer before trying to recover the recycle bin. Your next move should be to download recycle bin recovery software like Data Recovery Pro. After you’ve installed the software a simple user interface and powerful search algorithms allow for high recovery success rates. We keep all kinds of important information on our computers. All it takes is one mistake to lose that information forever; unless of course you follow the steps above and use ParetoLogic’s Data Recovery Pro. Remember that video project from last month that you were working on to send to your grandmother? You do remember the file name and location right? You wouldn’t have possibly deleted it would you? We all get busy from time to time, and with the increasingly integrated part our personal computers play in our lives, managing files can get overwhelming. If you can’t find that project you were working on, you’re probably scratching your head trying to figure out how to locate and recover lost files. The first place you look should of course be the recycle bin. Inadvertent key strokes can send important files to the trash. A quick look in the recycle bin can sometimes locate the missing file. Are you being too specific with your criteria? Are you specifying the correct file extension? Are you searching in the right place? The answers to these questions can have an impact on your success. Make sure to be as general as possible about the file name. It’s easier to pare down your search results, than to fail to generate results because of overly-specific search criteria. Make your search area as general as possible. You may have moved the file, or it could be in a different directory than the one you assume. If you search the entire computer, you’ll have better odds of recovering lost files. When a general search doesn’t aid in your lost file recovery efforts, software such as ParetoLogic’s Data Recovery Pro should be used. Data Recovery Pro is a file recovery suite that can find lost files on your PC, emails, email attachments, and even files on peripheral devices such as your iPod. Data Recovery Pro exploits the fact that when you “delete” a file; the information isn’t automatically removed from the hard drive. What really happens is that the operating system marks the space where that file is located as being available for use. Until the operating system, a process, or the user saves new information to that location, the old file is still where it was. If you use the software before the operating system uses that part of the hard disk, the space will get marked as unavailable, and the location will be re-associated with the file name. Windows writes to the hard drive for almost everything it does. Because the lost file is at risk of being erased with every activity, you should stop using the computer immediately! Do not turn your computer off before trying to recover the file. Make sure you don’t download additional files. The very next step you take should be to download Data Recovery Pro. Once installed, the software will help you recover lost files, so long as they have not already been overwritten. No one that uses a computer for important tasks should be without ParetoLogic’s Data Recovery Pro. If you’ve lost a file and can’t find it in the recycle bin or through searching; use Data Recovery Pro. We’ve all done it. We’ve been working all week on an important project for work, only to lose the file the night before we’re scheduled to make our big presentation. Or maybe you took hundreds of photos of a friend’s wedding, and then accidentally deleted them. And then there’s the important email message that you swore was in your inbox last time you were on your PC. As we become more comfortable with the use of digital media, it’s increasingly important that computer users understand how to recover deleted files. The first step to locating missing files should be to check in the recycle bin. Errant keystrokes can inadvertently send important files to the trash. A quick look in the recycle bin can sometimes reveal the missing file. Are you spelling the file name correctly? While these are simple questions, their answers can have a profound impact on your success. Make sure to be as general as possible about the file name. It’s easier to sift through a list of possible matches, than to omit results because of overly-specific search criteria. Additionally, specify searching the entire computer. You may have inadvertently moved the file, or it may have been in a temporary folder because the user forgot to save the file after it was created. By searching the entire computer, the odds of success are greatly improved. Sometimes using search or the recycle bin doesn’t locate the file you need. In those instances, data recovery software such as ParetoLogic’s Data Recovery Pro should be used. Data Recovery Pro is a powerful data recovery software suite that can find lost emails, email attachments, files on your pc, and even files on peripheral devices such as your iPod. Data Recovery Pro takes advantage of the fact that when you “delete” a file; the information isn’t automatically removed from the hard drive. What actually happens is that Windows marks the space where that file is located as being available for use. Until Windows, an application, or the user saves new information to that location, the old data is still there. If you use Data Recovery Pro before Windows uses that section of the hard drive, the space will get marked as unavailable, and the location will be re-associated with the file name. Each time you perform a task on your computer, Windows writes to the hard drive. Because the lost file you are trying to recover is in jeopardy of being overwritten with every activity, it is extremely important to stop using the computer immediately! Additionally, you do not want to turn your computer off before trying to recover the file. Make sure you don’t download additional files. The only thing you want to download is Data Recovery Pro. Once installed, Data Recovery Pro’s intuitive user interface will allow you to find the missing file, so long as it has not already been overwritten. ParetoLogic’s Data Recovery Pro is a valuable tool that no computer should be without. If you can’t find a file in the recycle bin or through searching; use Data Recovery Pro to find missing, deleted, or corrupt files, emails, and email attachments. It’s happened to all of us. We take our camera out to capture a few photos and when we get around to printing them or viewing them, they are nowhere to be found. Worse yet, imagine spending thousands of dollars to take the trip of a lifetime, buying a new camera and storage media specifically to document the trip, and create lasting memories; then upon returning home, not being able to see or find any of the images because of corrupted storage media. Luckily Stellar Phoenix offers their suite of photo recovery software which allows users to recover lost or accidentally deleted photos from a variety of sources.